At a time when inequities in criminal justice are the focus of intense national debate, blacks and Latinos are overrepresented at every step in Colorado’s criminal process compared to their numbers in the general population. 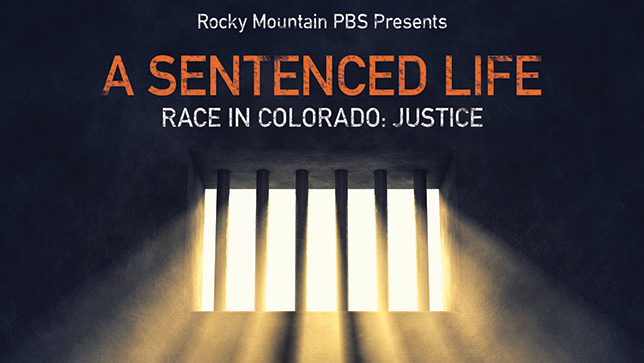 Black and Latino Coloradans are disproportionately incarcerated, shot by police, arrested and detained as youth, arrested for marijuana, sent back to prison from parole, and disadvantaged by a criminal record, a Rocky Mountain PBS News examination of state data, records and reports shows. In 2014, black adults were six times more likely than white adults to be in jail or prison in the state, and Latino adults were nearly one-and-a-half times more likely, according to the analysis. One cause cited by experts is widely acknowledged discrimination within the system – often discussed as implicit or unrecognized bias. Others cite failures in schools and neighborhoods that clear the path to the criminal justice system. The disparity in the incarceration rate takes a broad toll on the state’s minority residents, experts say. “You’re absolutely depleting the communities of color of natural resources like fathers, good neighbors, babysitters, carpool drivers,” said Allison Cotton, professor of criminology at Metropolitan State University of Denver. A criminal sentence can carry lifelong consequences, particularly for those of limited means. Many provisions of state and federal law obstruct a return to normal life. Among the restrictions and exclusions: public housing, certain safety net programs and hundreds of specified jobs. In response to the broad inequities for people of color, reform efforts are underway in Colorado and nationally. This year, the state legislature considered bills to encode a driver’s race and ethnicity in the magnetic strip of their driver’s license to track data on racial profiling, sentencing reform to remove certain mandatory minimums, and legislation to help people shut out of employment because of the stigma of a criminal arrest. In April, Gov. John Hickenlooper signed a measure to allow judges to sentence defendants to concurrent sentences rather than consecutive sentences. He also approved a bill that redefined the purpose of parole away from punishment and towards support and supervision of offenders’ individualized needs and risks. Coloradans, from criminal justice reform advocates to police chiefs, are examining the issues with an eye toward solutions. Juston Cooper, deputy director of the Colorado Criminal Justice Reform Coalition, an advocacy group, urges the state to consider investments in other services, such as the public health and education, to enhance public safety. “Effective crime prevention strategies are not solely in the wheelhouse of the criminal justice system,” he said. Colorado’s experience with mass incarceration mirrors the nation’s. 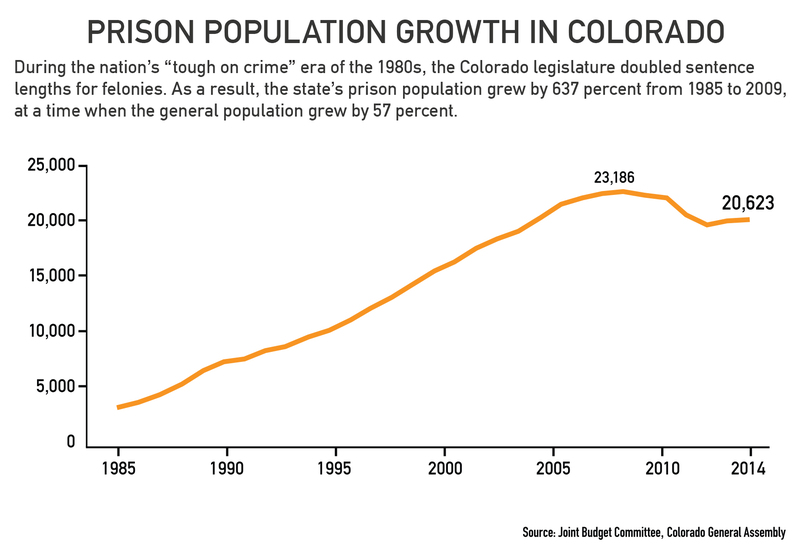 As a result, from 1985 to 2009 the number of prisoners in Colorado skyrocketed to its highest recent number of 23,186 inmates, or up 637 percent during a period that the state's population grew by 57 percent, according to the legislative Joint Budget Committee. General Fund appropriations to the Department of Corrections increased 552 percent in that period adjusting for inflation, up to $332.6 million. “Tough on crime” approaches to public safety haven’t worked, reform advocate Cooper said, and the cost to society affects all Coloradans regardless of status, race or ethnicity. In 2015 Colorado had 20,304 prison inmates and 9,134 parolees, according to the state Department of Corrections. While Latinos comprised 21 percent of the state’s population, according to the U.S. Census Bureau’s 2014 American Community Survey, they represented 32 percent of inmates in 2014. For blacks, the comparison was 4 percent of the population and 18 percent of inmates. 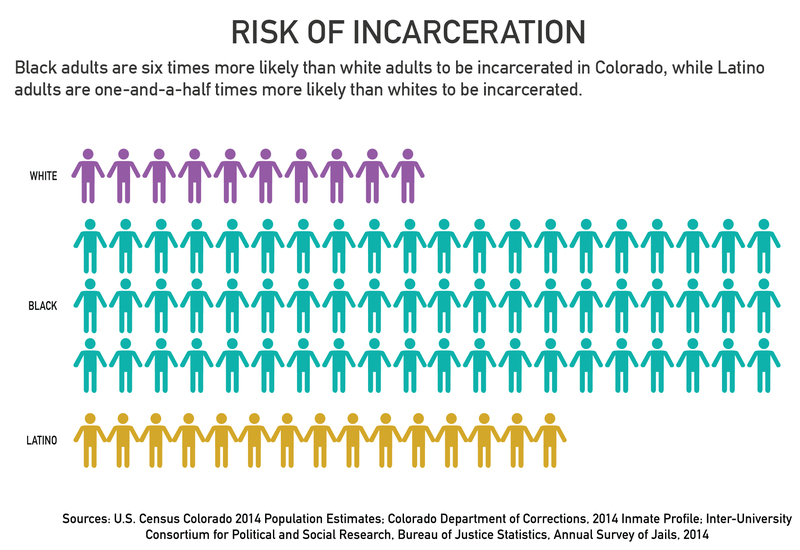 Whites were under-represented at 69 percent of Colorado’s population and 45 percent of inmates. On average, one prison inmate costs taxpayers $36,892 a year in Colorado, according toDepartment of Corrections 2014-2015 numbers – more money than a year of in-state college tuition at the University of Colorado or Regis University. The Department of Corrections is just one player in the messy flowchart of intersecting institutions that comprise the criminal justice system. To get a better picture, researchers tracked the numbers of people of color at key points in the system, from contact with law enforcement through a parole board decision. In 2011 the state published a comprehensive report that detailed the level of representation of people of color at each juncture. While Colorado’s population was 4 percent black in 2008-2009, the composition of adult arrestees during that period was 11.8 percent black, admissions to the Department of Corrections were 19 percent black, and the number of people sent back from parole with a new crime was 24.7 percent black. While Hispanics numbered 20 percent of the state’s population, they comprised 33.3 percent of DOC admissions and 29.2 percent of people sent back from parole with a new crime. The report did not break out the percent of Hispanics arrested because of lack of arrest data including ethnicity. Five years after that report, Public Safety’s Hilkey says we still don’t know the true extent or cause of racial inequities in the numbers pertaining to criminal justice. Yet, the state body specifically tasked with finding solutions to racial disparity in the criminal justice system last met February 2015 and is now on permanent hiatus. The Minority Over-Representation Subcommittee is part of the Colorado Commission on Criminal and Juvenile Justice, involving a diverse membership from the fields of defense, prosecution, mental health, prisons and crime prevention. Commission and subcommittee chair Hilkey said the group will continue to address issues of racial disparity through other avenues other than the subcommittee. Part of the answer, Hilkey said, is understanding bias that we carry around without realizing it, called “implicit bias,” or habits, practices and beliefs that unconsciously create prejudice against certain races or ethnicities. Police agencies need to confront underlying subconscious bias head on, Lakewood Police Chief Kevin Paletta said. “We’ve got a long way to go down this road,” he said. According to a survey by the Colorado Association of Chiefs of Police, over a dozen police departments have training on recognizing police implicit bias and de-escalating high-stakes situations with civilians, or they plan to start that training soon. Research from the University of South Florida forms the basis of the U.S. Department of Justice-backed program Fair and Impartial Policing. The Colorado State Patrol has participated in that training, program founder and criminology professor Lorie Fridell said. A handful of Colorado’s other law enforcement agencies – including Grand Junction and Lakewood – are engaging in procedural justice training, a program recommended by the Obama administration initiative, the President’s Task Force on 21st Century Policing, trainer and Lone Tree police chief Jeff Streeter said. Evans Police Chief Rick Brandt, president of the Colorado chiefs association, said society needs to move toward a rehabilitative response to crime as police officers increasingly grapple with a variety of social ills, such as homelessness and substance abuse. “Putting drug addicts in jail doesn't solve the problem in the long run because they're going to get out and we're going to deal with them again,” he said. Racial disparity in the justice system is also a manifestation of racial inequality in other parts of society, including schools. For example, in Colorado’s 20 most populous school districts, only 66 percent of Latino students and 70 percent of blacks students graduate high school, according to a Rocky Mountain PBS News analysis. People of color without a high school education made up 25 percent of everyone sentenced in Colorado for a non-immigration offense between 2010 and 2014, according to U.S. Sentencing Commission data. The result is not cheap. One high-risk 14-year old who becomes a “career criminal” with multiple incarcerations can cost society as much as $5.3 million, according to 2009 research from Vanderbilt University and the University of Maryland. Society needs to invest money to address the root causes of violence and delinquency, said Beverly Kingston, director of the Center for the Study and Prevention of Violence at University of Colorado Boulder. Kingston points to over 50 evidence-based programs that have been shown to reduce youth violence in a database compiled by the U.S. Department of Justice’s Office of Juvenile Justice and Delinquency Prevention. One such program, Steps to Success, has taken root in Denver’s Montbello neighborhood and is managed by Kingston’s center with partners. It involves bringing parents, children and teachers together to strengthen communication and positive community bonding and reduce adolescent aggression and misbehavior. The news website The Marshall Project maintains a collection of the best articles on the web about criminal justice. The Office of Research and Statistics at the Division of Criminal Justice at the Department of Public Safety is a major source of criminal justice research in the state and publishes their reports online.  In 2007 The Colorado Legislative Council released a report overviewing the adult criminal justice system in Colorado, including major historical changes to sentencing policy. The Fair and Impartial Policing program supported by the U.S. Department of Justice maintains a list of research articles on bias in policing. You can track trends in incarceration and the growth of jail populations in your county through a data visualization by the Vera Institute of Justice, a think tank. Sesame Street has a toolkit for helping children and families cope with incarceration. The Colorado Criminal Justice Reform Coalition has a list of resources for people impacted by the criminal justice system. Search all of the “collateral consequences” of a criminal record in Colorado and other states, that is, jobs and parts of society that people with a record are restricted or barred from, through the American Bar Association’s National Inventory of the Collateral Consequences of Conviction. Jobsforfelonshub.com is a jobs site for people with a felony record. Research from Vanderbilt University and the University of Maryland from 2009 estimated one high-risk 14-year old who becomes a “career criminal” with multiple incarcerations can cost society as much as $5.3 million. Researchers in Colorado are examining how to prevent young people from committing violent crime and becoming involved in the criminal justice system. You can read some of this research from the University of Colorado’s Beverly Kingston and Eric Sigel online. The Steps to Success program in Montbello makes its research methods and data available online. A new way to screen young people for their risk of violence is the Violence, Injury, Protection and Risk Screen Tool (VIPRS) designed for primary care givers and others who interact with young people. The National Institute of Justice of the U.S. Department of Justice tracks programs and practices aimed at crime reduction, along with their effectiveness. The U.S. Department of Justice’s Office of Juvenile Justice and Delinquency Prevention keeps a similar database ranking programs for young people. Learn more about the drug for opioid abuse, Vivitrol, mentioned in the documentary.